Tanks for the Memories, an Illustrated Water Tank Glossary. A Salute to Standpipes, "Tin Men", Waterspheres, Torosphericals, Spheroids and Hydro-pillars. Hats off to water towers. 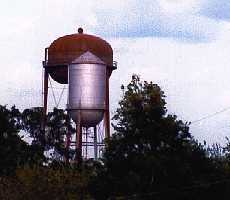 Ground level storage tanks, sometimes simply called reservoirs, are basically water towers without legs They have a height equal to or less than their diameter and are usually placed on elevated positions where available. Standpipes have heights greater than their diameter, but still no supporting superstructure. 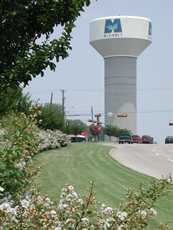 While water tower companies still offer ornamental architectural elements that can turn utilitarian tanks into works of art - most communities consider this a frivolous expenditure and leave standpipe decoration to the next graduating high school class. tank encased in ornamental limestone. In the world of water storage, the icon is the riveted tank. 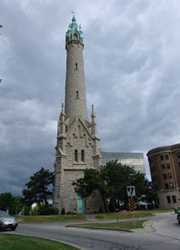 Once the pride of the community, these towers were proof that towns had outgrown their village or hamlet status. 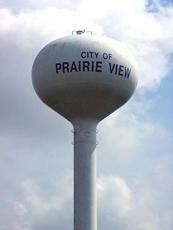 Whenever the subject of water towers comes up, it's the riveted tank that appears in the mind's eye. References to the tin woodsman in the Wizard of Oz are frequent. State-of-the-art when installed, these towers were built better than they had to be and are still holding their water in tens of thousands of towns. Ironically, these towers which had once been the symbol of modernity, are now being dismantled, in many cases, simply because they "look old." The Pedesphere is the familiar "golfball-on-a-tee" design. These tanks can contain anywhere from 25,000 gallons to 150,000 gallons. Despite what would appear to be the obvious, the support column does not contain water but merely encloses access ladders and the pipes that connect to the tank. When examined up close - the bell-bottom base has a door allowing access to pumps and controls. 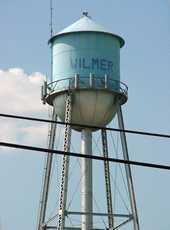 The multi-column water tank is most economical design and according to company propaganda, it's also the most efficient. Most of these have access ladders on the tower and a catwalk and handrail around the tank. These are usually the towers a community installs after they have outgrown their riveted tank. 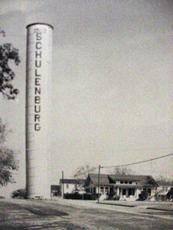 These were postwar favorites with subdivisions and suburbs all across the country. AKA "Big Mamas and Motherships"
We haven't come across any literature using the term "mothership" but we have heard variations of Big Mama used by staff members. 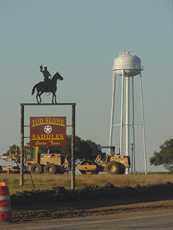 Clyde Burns of Huntsville, Texas, a man who has erected, dismantled and reassembled tanks for forty years, informs us that larger water spheres are more correctly called water spheroids. These usually hold 200,000 gallons and up. 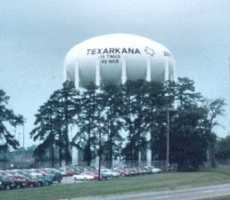 Within this group are the Torospherical Tanks - like the one shown here in Texarkana. As the demand for water increases, newer designs requiring less maintenance are needed. The new tank on the block is the Hydra-pillar. Hydra-pillars have a large diameter (concrete or corrugated steel) shaft - which eliminates the costly and time-consuming painting of framework and scaffolding. 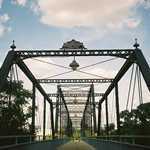 These are gaining in popularity in cities like Plano and McKinney (shown here).